The Troy Bilt Storm Tracker 2690 XP Snow Blower is not a machine that you will commonly find engaged in small snow clearing jobs. It’s far too big and powerful for that. This machine has been specifically designed to work in all types of conditions, from very deep snow to highly compacted snow. 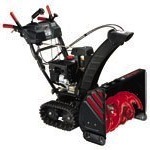 The snow thrower is powered by a 0.21 liter engine that has been designed and built in house by the guys at Troy Bilt. It’s a 4 stroke which means smoother running and no need for you to mix the gasoline and oil. The Troy Bilt Storm Tracker 2690 XP snowblower has a clearing width of 0.66 m (26 inches) and an intake height of 0.53 m (21 inches). This allows it to tackle quite deep snow drifts. Probably the most interesting feature on the Storm Tracker 2690 XP snow thrower is the fact that it uses tracks instead of wheels. The most obvious and immediate benefit of this is that the tracks will massively increase traction when compared to snowblowers with regular tires. The tracks have a width of 0.11 m (4.5 inches) and there is always at least 0.25 m (10 inches) of track on the ground. The actual ‘bucket’ on the Troy Bilt Storm Tracker 2690 XP snow blower uses skid shoes to prevent the bucket potentially scraping the ground and damaging it. These skid shoes are also reversible, so once they wear down, you just need to flip them over. The auger used in the 2690XP is made from strong serrated steel that easily destroys the snow before the impeller blows it out through the chute. Both the auger and the impeller have a diameter of 0.3 m (12 inches). If you are looking for something a little smaller than this model you should have a look at the Troy Bilt Storm 2410 Snow Blower, but if you are looking for something a bit bigger, then have a look at the Troy Bilt Storm 2840 Snow Blower. Click Here to buy the Troy Bilt Storm Tracker 2690 XP Snowblower. Not satisfactory in most respects, my son used it and was OK with it, I used it and it wore me out, my wife used it and she loves blowing snow, we traded it for a Cub Cadet. Pros: Easy to start, hand warming handles, nice headlight. Steering controls work well as far as it goes but is not smooth. Slow forward speeds worked best but the trade off was time spent moving snow. Cons: Engine runs too slowly to propel snow more than a few feet. Reverse is all but nonexistent. Dragging it backwards is much more efficient but back breaking. Very hard to maneuver and snow clogs chute because of lack of power. Actual swath after first pass is no more than 15″ of 3″ of snow because of slow engine speed. Nice concept but this machine is too light for this drive and the transmission needs help. Chute control is difficult and unresponsive, does not lock in place consistently.